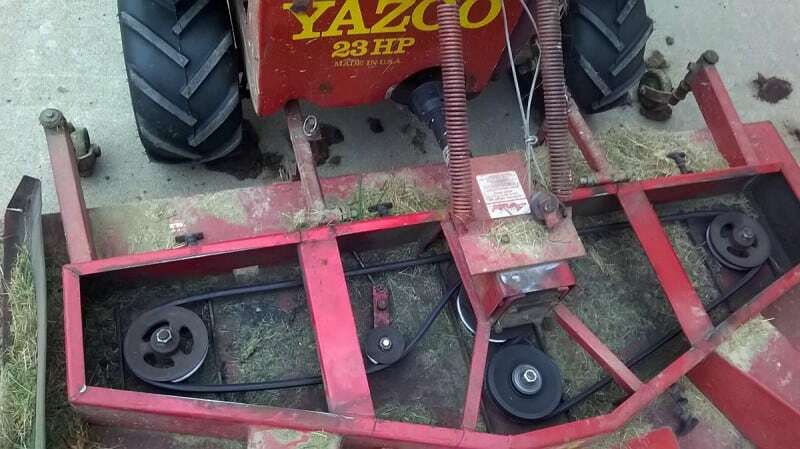 When I got the Yazoo mower home and began getting familiar with it, I noticed the mower deck’s belt tensioner was maxed out, and the belt really wasn’t all that tight. However the belt looked fairly new though, so I am suspecting it was slightly larger than the original factory size. The belt would slip off the pulleys occasionally, after only very large bumps initially, but as this happened several times the belt has been wearing out fast; becoming yet even looser and causing the issue increasingly often. Eventually it began happening constantly, and I decided it would need a new belt (hopefully slightly smaller this time!) But since funds are tight right now, I wanted to see if there was anything I could do to make the existing belt last for a little while longer. If you look closely, you can see that the Yazoo’s belt tensioner is an idler pulley mounted on a hinged lever. There is a rod connected to it that pulls the lever tight against the belt, using a threaded portion (out of view) with a jam nut against the deck housing. In the above picture, the nuts are threaded tight to the end of their threads, and the tensioner is at its maxed position, yet you can see how slack the belt appears. So my first thought on how to tighten things up further was to mount a larger diameter pulley on the existing lever. But I don’t have a larger diameter pulley, so that meant still spending money. Then I realized I could also drill a second pivot point into the lever, re positioning tensioner pulley out an additional 2-3 inches. The nice part is that if I ever need to revert to the original belt size, it will be a simple process to move the lever back to the factory setting, just using one bolt. I removed the tensioner assembly, and discovered the spacer underneath was welded on. 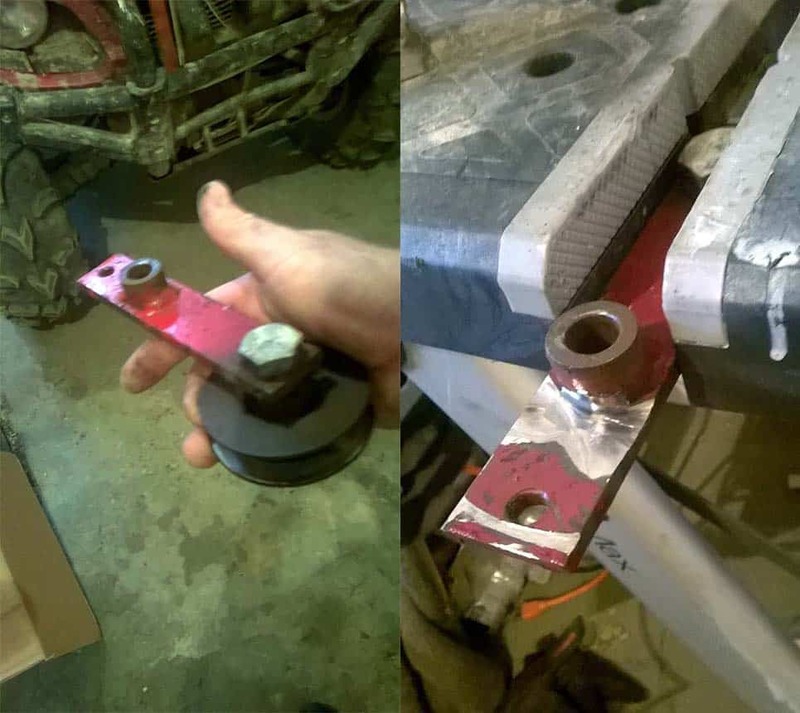 So I needed to grind those welds with an angle grinder in order to move it to my new pivot point. 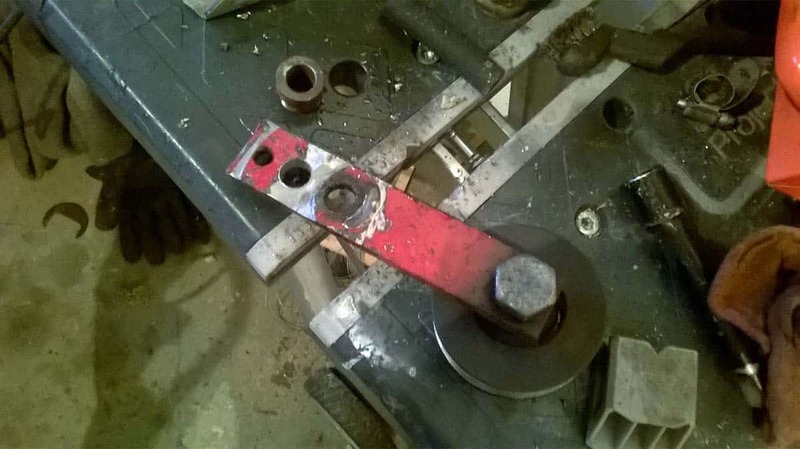 Once the spacer was separated from the lever, I drilled my new pivot point hole. And here is the final result after reassembly. The belt is fairly snug again, so should have some decent usable life still in it. You can see the original hole in the tensioner lever. If I ever need to revert, I just remove the one bolt, position every thing back in the old hole and replace the bolt. Very easy! I was pleased with the result of this little mod, because it reminded me that you don’t always need to spend money and replace a part. Had money not been tight, I am not sure if I would have taken the time to consider other options, but now I am glad I did. I feel the mower can now utilize a wider size range of belts, and I have much more adjustment range as well. I have a few more mods in mind for this mower as well. More on those coming soon! Glad to see you enjoying an great mower. I recently purchased a 1986 YR 60. Mine had clutch issues and was unable to locate new clutchs. I just swapped the reverse clutch to the forward and it works great. I also boght the ag tires. Great mower. Thanks for your information. That great Joseph! I am surprised just swapping the clutches did the trick! Does it work well now in both directions? Had you already tried tightening up the clutch adjuster? It seems moving the adjuster even just one notch can make a big difference! Hi Bruce, I noticed the same on my manual transmission Yazoo. I had the gear box apart later and it appears to be by design. The Low / High selector does not affect Reverse. They have Reverse geared in between (ratio wise) the two speeds. It will be faster than forward when in Low, but slower than forward in High. I have a Cub Cadet LTX1042 tractor mower. 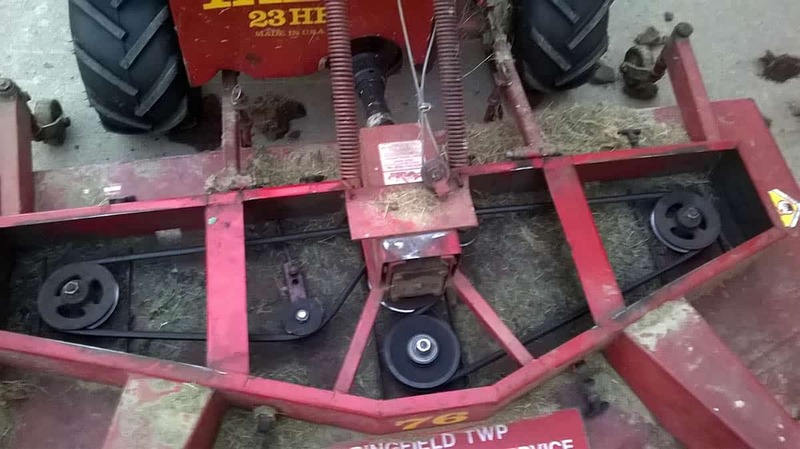 Just replaced blades, but now the mower is throwing off the drive belt for the blades (sporadic). Checked everything on the deck, replaced the belt, removed and replaced the deck a bunch of times looking for the problem. Idler pulleys seem OK. Belt guides all in their designated places. Tensioner for PTO to engage blades seems OK. Will now check to ensure deck is level side to side on the mower. If nothing is found, am wondering if I can replace the standard 96 1/2” belt with a slightly shorter one, perhaps 94” or 95”. Anyone ever tried that? 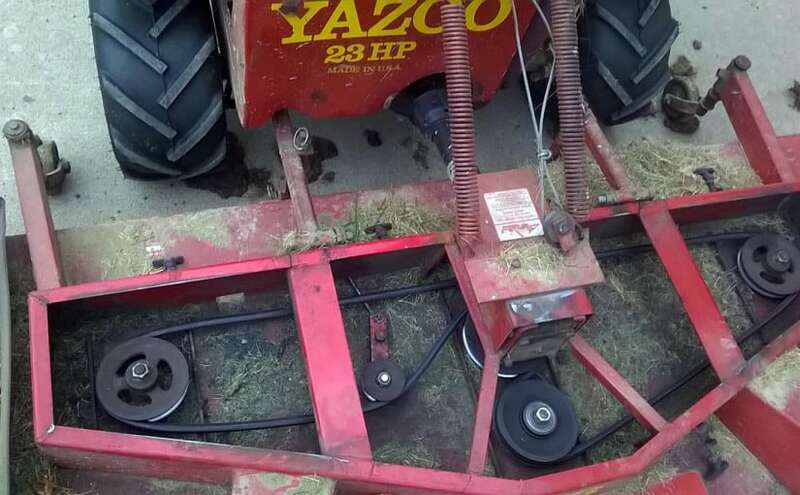 Hi Gary, I am not not familiar with that mower, but a slightly shorter belt may work if there is enough adjustment in the idler pensioner pulley. In my experience thrown belts are usually due to either too loose of a belt, or pulleys that are too far out of alignment with each other.